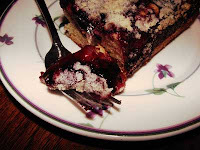 Warm Blackberry coffee cake, made me wish I had vanilla bean Ice cream. This is a brand new recipe I cooked up last night, it was delicious, there is always a time when you suddenly wish you had vanilla bean ice cream. I enjoy fresh blackberries, but all I had on hand was a can of blackberry pie filling so I used that instead. 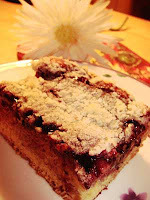 Coffee cake can be many flavors, this is just one enticing way to add something special to your coffee cake. Ingredients: 1 1/2 c. Flour 1 tsp. Baking powder 1/2 tsp. salt 1/2 tsp. baking soda 1/2 c. sugar 1 Tbs. Butter melted 1/2 c. Milk 2 eggs 1 c. Blackberry pie filling Directions: Preheat oven to 350 Degrees and grease a 9 x 9 baking pan. Mix together flour, baking powder, salt, baking soda, and sugar. Add melted butter, milk, and eggs. Mix together until smooth. Pour coffee cake batter into greased baking pan. Topping: In a small bowl mix 1/4 c. flour, 1/4 c. sugar, and 1/4 tsp. nutmeg. Cut in 2 Tbs. Butter Spread half of the topping on to the batter, then add all of the blackberry pie filling. Spread the rest of the topping on top and bake for 1 hour. We're doing a recipe swap of sorts. When your done reading this recipe head over to Rachel's blog the Bakedblog.com to check out my recipe for Apricot Squares on her site and all her other great recipes! My it sure looks delicious. I am going to try to bake one by myself. it does look good. My friend Rachel made it. I might try it myself, sometime soon! I'll save this recipe for those times when I've mess up badly, then POW! cake in the face! yes, yes... that's how I roll! seriously tho' great looking cake. I'm hopeless with baking so I'm sure it will take me a few tries to get it. Should be fun tho'. This coffee cake does look good! I'm going to get the ingredients soon to make it myself :D My husband and daughter have a major sweet tooth too! mmm that sounds so good! I will have to lighten it though since I have been on weight watchers!